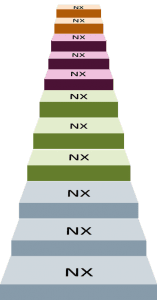 This article reviews the processes and options available in the newest NX “continuous release” version. A fair number of customers still don’t know quite what this means. Let’s eliminate that ambiguity! 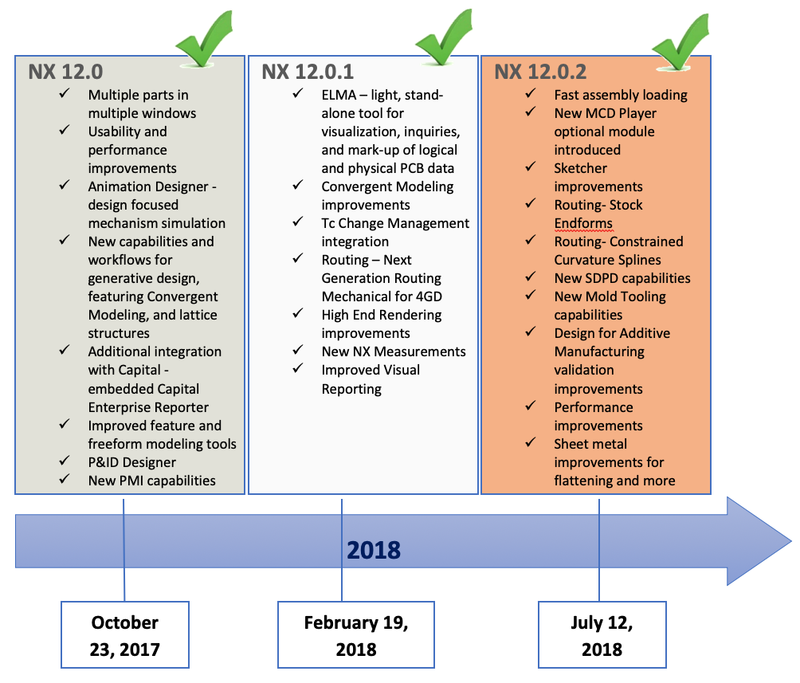 Until the end of 2018, NX software operated like every other CAD/CAM/CAE application. Covert versions of the software including improvements to functionality are evaluated and tested for acceptance until being formally released to the public. Although the customer is usually blasted with notifications of the new version being available, they opt out more times than not. This is because the ROI usually isn’t worth the cost of implementation–even to a limited group within their user base. This routine interval varies between software developers and applications but generally spans from a few months to more than a year. 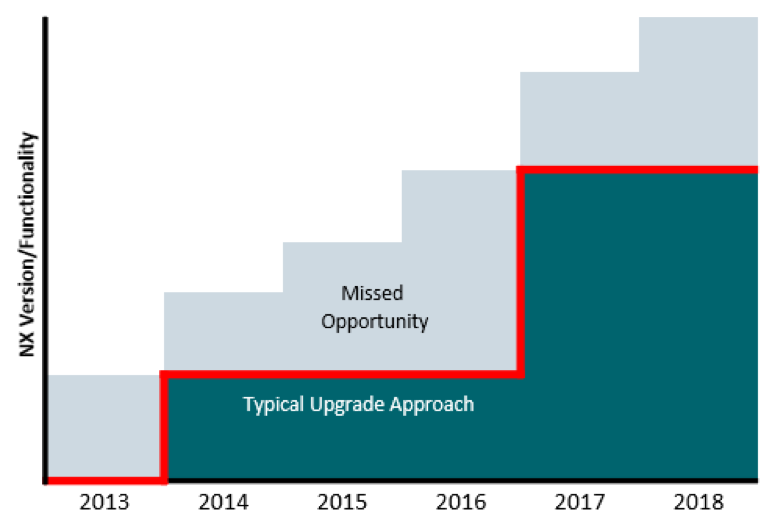 As a result, when the customer chooses to pass on a few versions of the new functionality, they can quickly become years behind in software releases. The perceived high cost of deployment makes some customers reluctant to take the next step. This traps end users into using older software with frustrating bugs and shortfalls in effectiveness. Training costs snowball, especially when user base increases without requiring new s/w functionality experience – more to learn & more people! 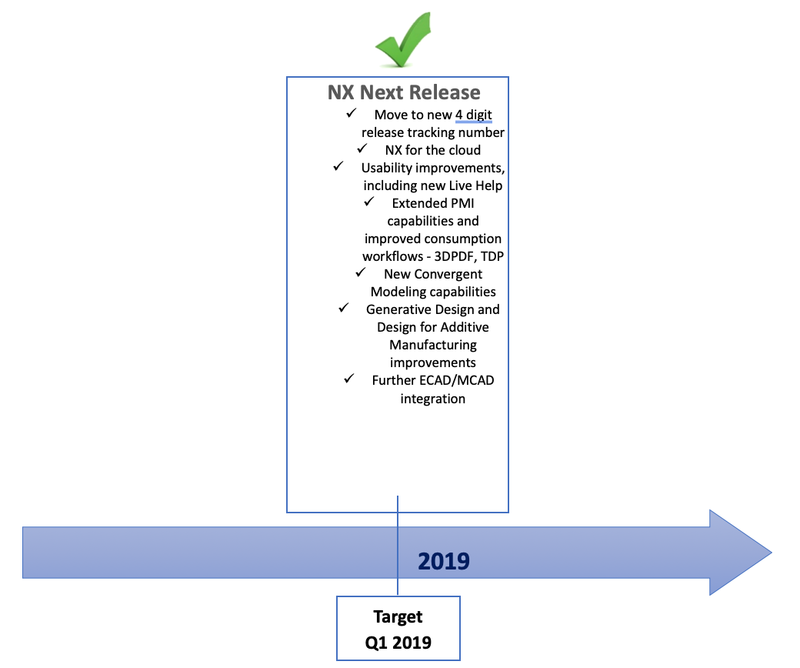 What is changing with NX Continuous Release? How will the new release and update model work? How will NX settings and configurations be supported? How will NX Open custom applications be handled? How will the installation evolve? How will 3rd party integrations work? Note: Automatic update is not mandatory, customers can still continue with their traditional process of manually downloading & installing NX using GTAC. 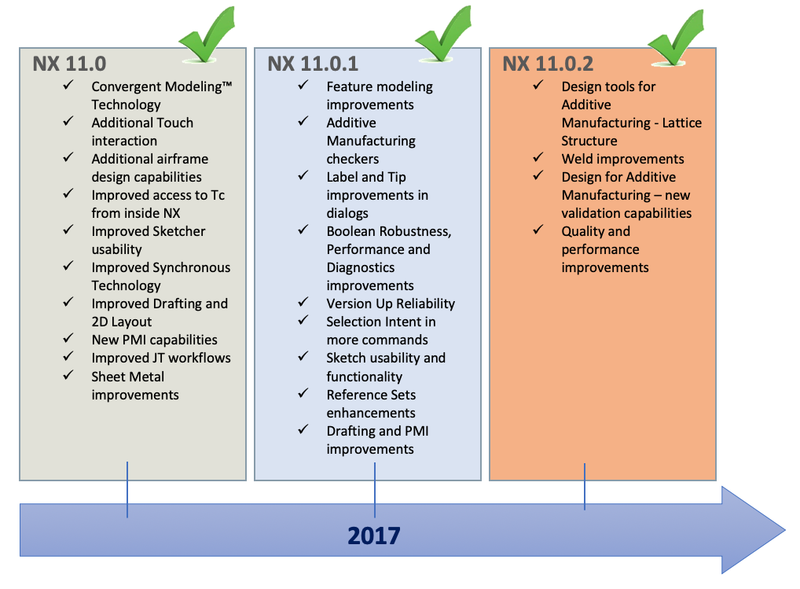 All new features, enhancements, and quality improvements in NX are now delivered in a continuous fashion. The update notification icon is available in the Ribbon Bar of the NX interface. The status of the NX installation and the availability of software updates. The color of the icon indicates the status of the NX installation and the availability of software updates. The NX software that is installed on the workstation is up to date. A software update is available and not yet downloaded on the workstation. An important software update will be available soon. A software update is downloaded but not installed on the workstation. The software update notifications are disabled. You can use the Software Update customer defaults to enable the notifications. The NX software is not installed using a .msi file. The NX software is not part of the main channel. The NX software cannot connect to the update server. You can point the cursor to the notification icon to know more about actions required from the user. You can download an update by clicking the notification icon. NX checks the user authentication before downloading the updates. 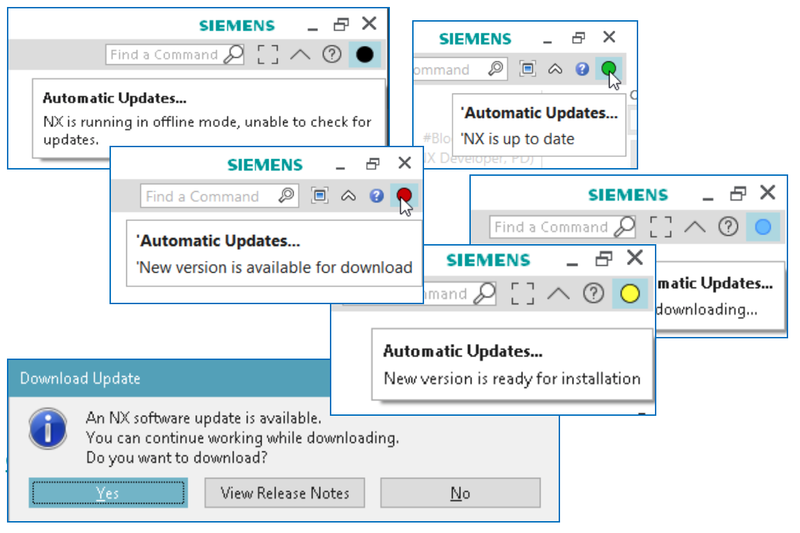 Software Update Lets NX administrator turn on the automatic notification and download of updates. Download Location Lets NX administrator customize the folder location for downloading updates. 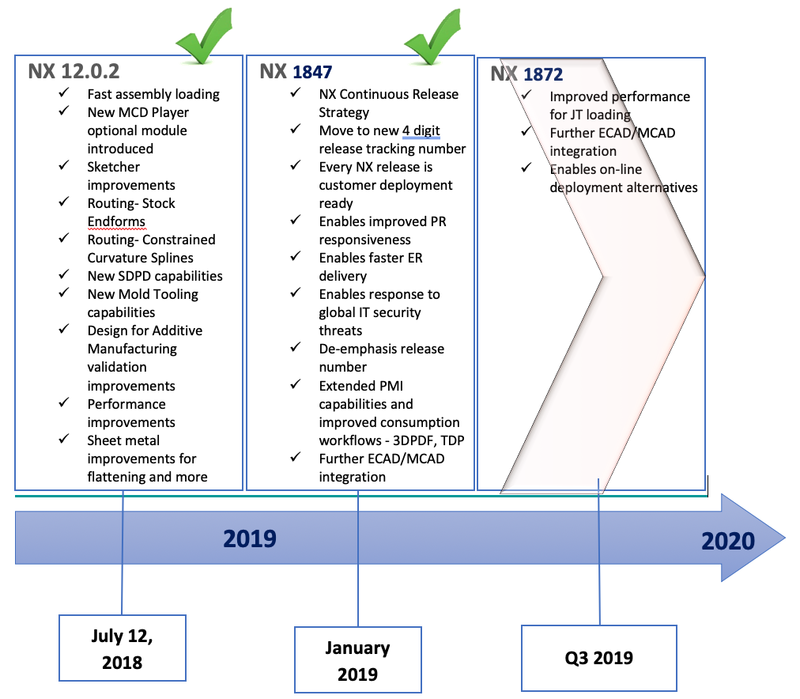 If you’ve been watching the NX software evolve in the last several years, you have probably noticed a direct relationship between the kinds of interface changes in Microsoft Office products and subsequent releases of Siemens NX. (In case you weren’t aware, there is a contractual agreement between Microsoft and Siemens.) As the toolbar-based interface developed up through NX8.5, the addition of “Add or Remove Buttons” options and user enabled docking and undocking came to be. 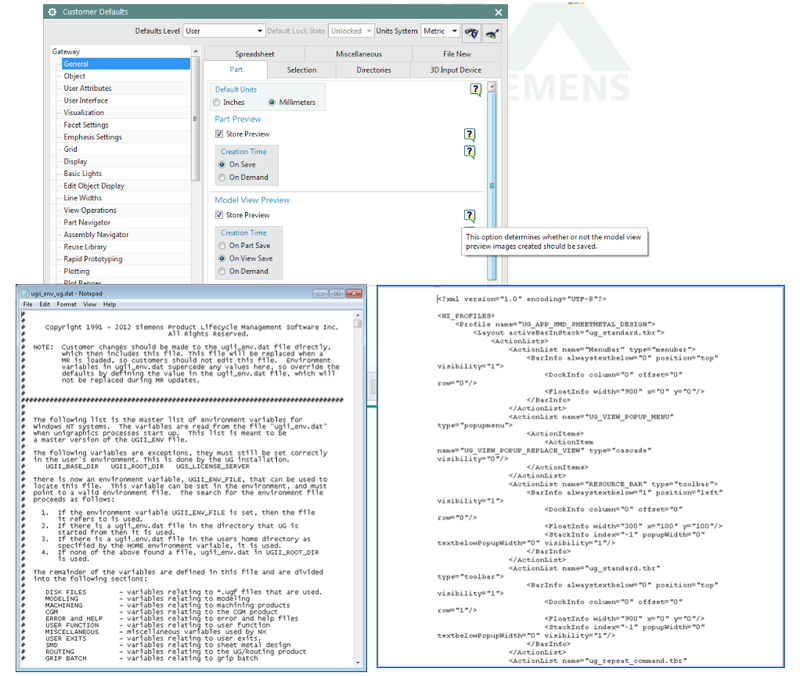 Just before NX9, MS Office tools introduced the Ribbon Bar and, in turn, Siemens emulated that look and feel and customization functionality. Consistent with those changes, we are now seeing the shift from routine intervals in NX version releases and updates to a continuous release process just like that of Windows 10. 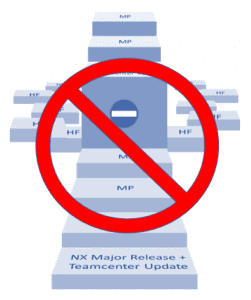 Now, the process of updating and improving NX functionality and stability can be practically invisible to users and potentially eliminate those major implementation projects for IT and CAD administrative personnel that so often distract and obstruct users or even temporarily shut down production. 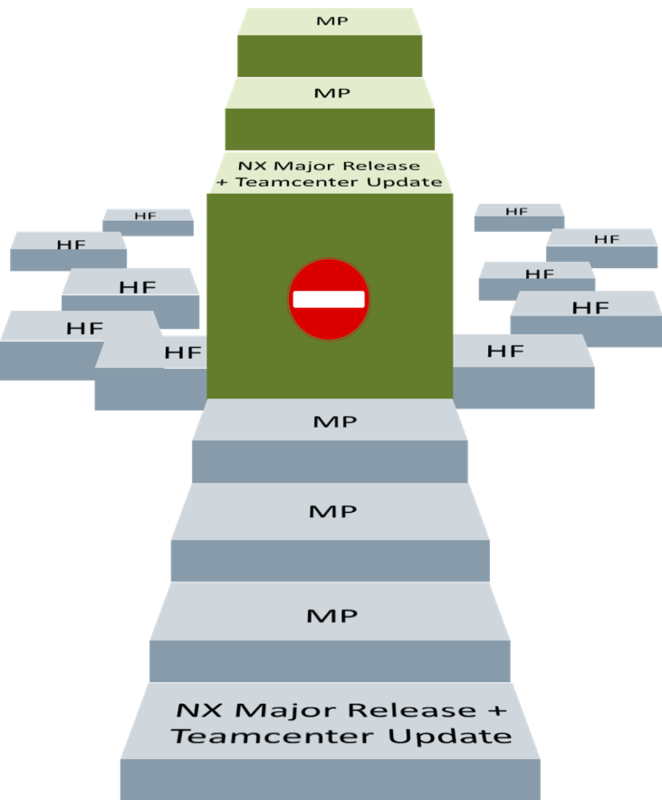 This article attempts to clarify those update processes and remove the ambiguity of how NX Continuous Release works, how it can be managed, and what benefits are obtainable for users and software administrators alike. We hope it proves to be beneficial and informative.